The Ground Hog HD99 is a Towable Hydraulic Earthdrill that is designed to be powerful, easy to use and require very little maintenance. The HD99 is the most powerful earthdrill in the Ground Hog line. 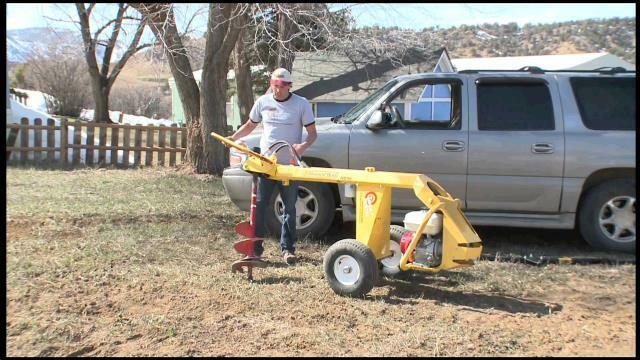 With it's 9hp Honda or Subaru engine, the HD99 can easily dig with any Ground Hog auger up to 18 inches in diameter. The use of hydraulics allows the HD99 to have variable auger speed and reverse which is very useful if the auger gets stuck. The HD99 is designed to take the load off of the operator by being almost perfectly balanced with an 8-inch auger attached, and the right angle design eliminates torque to the operator. 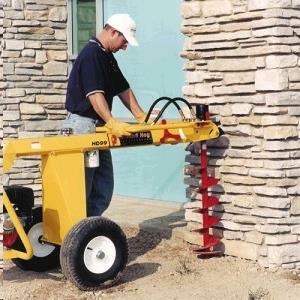 There are also 3 handlebar positions that allow for normal drilling, as well as close up drilling next to an obstacle such as a wall or fence. The drilling head also pivots from side to side for drilling on uneven terrain. Large highway rated tires make the HD99 easy to maneuver around the job site and there is a locking mechanism on the digging head that allows the auger to be held up and out of the way for moving the machine around the job without having to disconnect the auger. The heavy duty powder coated steel construction of the HD99 uses a pivoting engine cradle that protects the engine and lets it stay level for proper oiling and longer life. The low profile and compact design of the frame eliminates the need for telescoping booms and axles and allows the unit to be transported in the bed of a small truck. The HD99 also comes equipped with a towbar with a 2" hitch coupler and safety chains for surface street and jobsite transport. The hydraulic system used on the HD99 is extremely reliable and requires very little maintenance compared to mechanical systems, and the HD99 uses high quality Parker components. All the maintenance that is usually required is to check or change the hydraulic fluid and engine oil and replace the hydraulic filter. The uniquely shaped fluid reservoir holds 3 gallons of fluid while having a large amount of surface area to dissipate heat for higher efficiency. The reservoir has a dipstick for checking the fluid level and the drain plugs for the hydraulic fluid and engine oil, as well as the hydraulic filter, are easy to access and use without making a mess. 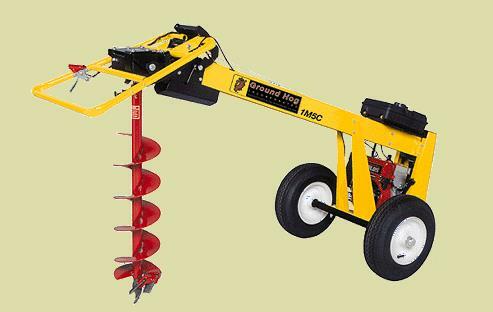 The Ground Hog HD99 is a powerful, well designed earthdrill you can rely on. * Please call us for any questions on our 1 man tow behind post hole digger rentals in Santa Ana and Orange CA.